The High Court in Belfast has held its first hearing to consider the legality of a search and arrest operation targeting Northern Ireland journalists Barry McCaffrey and Trevor Birney. The legal challenge is being taken by Fine Point Films, the filmmakers behind No Stone Unturned, a recent documentary about the 1994 Loughinisland massacre. Mr Birney and Mr McCaffrey were involved in the film and were arrested, questioned and released last week as part of an inquiry into the alleged theft of documents from the Police Ombudsman’s Office. Court proceedings were adjourned today to allow the court to consider proposals for an independent assessment of the materials seized from the journalists. 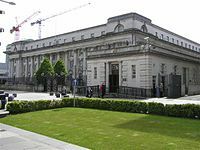 Barry Macdonald QC, acting for Fine Point Films, claimed that material had been taken which was not covered by the search warrant, The Irish Times reports. Members of the National Union of Journalists (NUJ) held a solidarity demonstration outside of the Royal Courts of Justice ahead of this morning’s hearing. The demonstration was led by NUJ assistant general secretary Séamus Dooley; NUJ Irish executive cathaoirleach Gerry Carson; and ICTU vice president Alison Millar. Mr Dooley told the demonstration: “The arrest of Trevor and Barry and the raids on homes and offices last Friday were truly shocking. “It would be reasonable to expect that the documentary might have had a response to the revelations, carefully and courageously laid out in No Stone Unturned, a response predicated on the need to finally bring to justice the killers of Adrian Rogan, Malcolm Jenkinson, Barney Green, Daniel McCreanor, Patrick O’Hare and Eamon Byrne.